It has been a few years now since I first heard of The Mom Pack website and its yahoo group. I recall being told, by an online friend, that someone named Lynn had started it. The best thing I remember about the email was that the website was FREE to list your business at and it received good traffic! Just what I was looking for a free listing on a popular website. Then they invited me to join the Mom Pack Yahoo Group not long after, and I did, but found so many emails a day a tad overwhelming. Much of it, at the time was not things I was interested in. I was new to the whole computer thing and websites, and just did not understand the whole networking idea of Moms promoting Moms and they traveled in packs. Now just a few years later, not only am I still a member I often find myself meeting new work at home moms online and telling them all about the Mom Pack. Some days I feel I promote it more then I do my own websites, which are resource sites offering resources and promoting women in business. Since the beginning, it has been gently handed over from Lynn to Julie as Head Mom and leader of the pack. If you have never been to the site, take the time to stop by, but I will tell you up-front you may be there longer then you expect to be. I recommend the 1st time visitor page to really get the concept of what the Mom Packs are all about. The website is full of so many things. I recommend book marking it, as it can be a little like Disneyland, a place you just don’t see the whole site in one trip to the website. From the Mom 2 Mom Directory, to the text links, helpful pages, and even pages where other Mom Packers have taken the time to offer free toppers for Mom Packs, there is information there to promote your business offline, free coupons and printables and message boards. Then the newest addition they have I think is the Give Back Program. I love that! The Mom Packs text link program is a way for moms to not only link together but it also helps increase your business in the search engines for those who participate in it. Since I joined the text link program, when I checked my websites in Google or Yahoo for sites that link to me, I found much to my delight the Mom Pack text link program, that other individual moms in business are linked from being in it showing up, increasing my incoming links. The Mom Pack, as I mentioned above has a Yahoo group that has now over the years grown into a few actually. There is the main list and now several spin off lists from the original main list. The list (a Yahoo Group) I once found a tad overwhelming and not my type of thing is now one of the 1st things I check every morning! The main list is full of Moms helping Moms. The networking I did not need in 2001, is now the networking I look forward to daily. Partly this is because I came to understand the whole concept and not think of the other Mom Pack members as competition that I once did. I now know if I have a work at home business question that if I ask they will answer! Need a link exchange? Yet again ask and they will answer. Still, it goes further then that. While it is all about Moms promoting Moms, it is also about and for Moms! Being part of it I know we have come to the place where we care about each other and offer help when we can. One Mom in need is just a post away from help with so many things especially when it comes to our children. From 1st time moms asking new baby questions, to us with older children asking things, someone will be there, willing to help. While the main reason for the group is our work at home businesses and most of the posts are questions about those it’s nice to know, that as Moms we are not alone, even if it’s not business related. It is also great to know that there are more than 1,400 other moms on the list all wishing you, as a fellow Mom Pack member, much success in business and life! Needless to say, I am a fan of the Mom Pack and feel I have gained so much more then I have given back over the years. I am so glad I finally got past seeing other moms in business as “the competition” and caught onto the whole idea called the Mom Pack! Their list grew so much that there are now a few spin-off lists for different things which makes it easier. The sales list is a great place to find a sale and members seem to feel a bond to each other and often offer Mom Pack only member special offers. What a great way to network with and support other moms. There are lists offering filler exchanges and advertising opportunities between members and even a few more lists. The Mom Packs newest spin off is the Mom Pack Auctions. I have certainly made a few new friends there. Julie’s business partner Lori runs the Auction and is easy to use. I have found bidding not only easy, but fun. I have gotten some great products for myself and gifts for family, and even advertising for my websites, all in this new fun place to bid away at. The benefits of being a Mom Pack member are enormous. All they ask in return, for all of this, is a link back to them on our individual website, other then that all is free to use and get listed on. To me, placing the Mom Pack logo and link on my websites is like posting the Good House Keeping Seal of Approval. 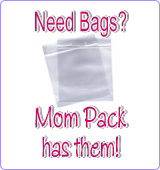 When I go to other work at home mom websites and see the Mom Pack logo I feel like I am shopping with a friend! I have made some good friends from being a Mom Pack member, but with more than 1,400 members, getting it to know everyone personally isn’t possible. Yet seeing the Mom Pack banner on their sites, I feel the Mom Pack bond of Moms promoting Moms! The connections you need for a successful online business! We have been online since 2000 helping home businesses moms (WAHM’S) find networking resources, and affordable advertising to help grow their businesses! Every Home Business Mom needs to find resources to promote her website through networking and advertising!